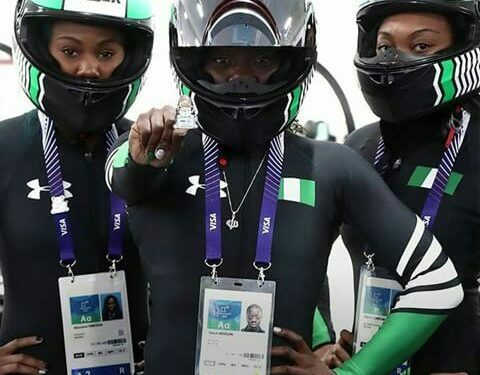 Nigeria’s female bobsleigh team who represented Nigeria at the Olympics in Pyeongchang have made history beautifully. Having represented the country well, more Nigerians are certain to get involved in the Bobsleigh sport. 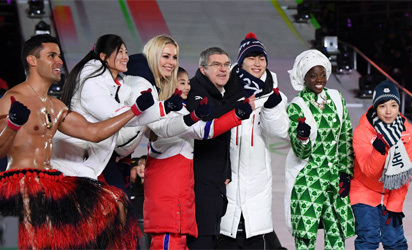 Nigeria’s Seun Adigun, the team leader, Japan’s Nao Kodaira and other dignitaries at the event made heart shapes with their fingers during the closing ceremony of the Pyeongchang 2018 Winter Olympics. 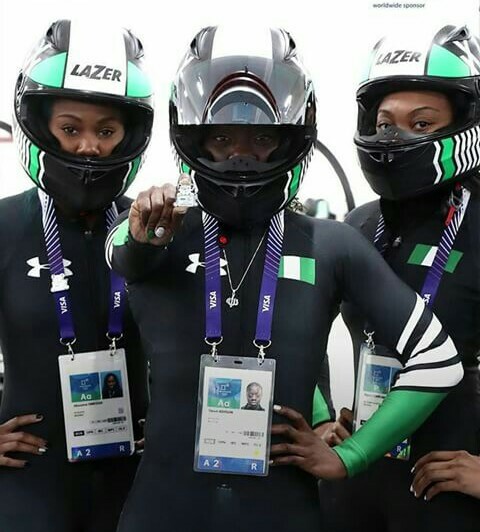 The Nigerian women’s bobsleigh team finished with the wooden spoon on Wednesday but left with their heads held high after an emotional Olympic debut in the crackpot winter pursuit. The bold West Africans, finished 20th in Pyeongchang, more than seven seconds behind gold medallists Germany in a sport where success and failure is measured in hundredths of a second. The Nigerian driver , Seun Adigun and partner Ngozi Onwumere after a landmark appearance, have been cheered on by their families and a vocal pocket of Nigerian fans. The Germans won gold after Mariama Jamanka steered her partner Lisa Buckwitz their country’s first success in the event since 2006. There was a gulf in class between Nigeria and Jamaica and the top three of Germany, the United States and Canada. But it mattered little to the tailenders. Congratulations to the team for their courage and resilience.